Bryson City's newest Hidden Gem! This beautiful, brand new log cabin is the perfect spot for your honeymoon or romantic couple's retreat. 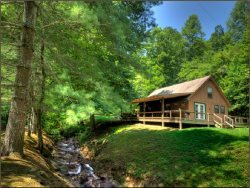 Honeymoon Heaven sits tucked away in the Hidden Creek area and sits right on the rushing creek. While the cabin itself is gorgeous, the outdoor area is it's own little paradise. With a fire pit by the creek, a spacious covered deck overlooking the water, porch rockers, and hot tub - you may never even want to go inside. The inside of the cabin is just as beautiful and inviting. The living and kitchen areas are all open in a nice open floor plan concept. The living area features brand new, comfortable leather sleeper sofa and recliner, rocked gas log fireplace, flat screen television with Direct TV service, and a sitting area with checker board table. The fully stocked kitchen and dining table has everything you need to make a delicious meal right in the comfort of your cabin. The private bedroom boasts a king sized bed, electric fireplace, and flat screen television with satellite service. The bathroom is it's own little sanctuary with jetted whirlpool tub, tiled walk-in shower, and electric fireplace.